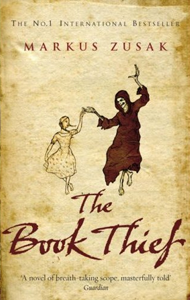 I acquired The Book Thief from Random House Children’s Books UK during my work experience. The book has two different covers – one for adults, one for children (similar to Harry Potter) and I found a copy of the adult version of The Book Thief in the office. However, I noticed that during trimming at the printer, the text at the bottom of the back cover got cut through the middle (this included the cover designers’ name). I pointed it out to one of the editors who said it was a good catch and asked if I was planning to keep the book. I asked if I was allowed, and she said I could, and so I did! Yay free books! Friday before we left London I managed to finish The Book Thief (UK adult cover shown) by Markus Zusak. The story takes place in Nazi Germany and is narrated by death but it centers around a young girl named Liesel. Liesel is on her way to her foster parents in Molching, Germany; the story begins on the train when her little brother dies—Death will visit the book thief two more times. Liesel, an 11-year-old girl, arrives in Molching and spends a long time having nightmares about her brother’s death, but her new papa is very supportive and encourages her to begin learning to read whenever the nightmares wake her. As Liesel begins to be more comfortable in her new surroundings and with her new parents, the terrible history of Nazi Germany begins to unfold before her. When her papa hides a Jewish man in the basement, Liesel befriends him and through their friendship, she begins to realize the injustice of the Fürer’s Germany. I really enjoyed how this book was written and how it unfolded. Death is an omniscient narrator and does a very good job of eluding to future events and still maintaining suspense. Very captivating tale and definitely worth the read. I read that book a couple of months ago, and loved it. I, too, really enjoyed the writing style, and I found the story to be captivating. I agree – totally worth the read. On my to read list it goes… Thanks!